She is a copy of the Black Madonna of Loreto. All a local tour guide had to say about her was: "She is like an address sign." Indeed, very many of the old houses in Prague bear some kind of image by which they are identified. As the Swiss gave their houses names, so the Czechs gave them images. At least this Madonna was important enough to be saved when the old house she used to adorn was destroyed and a Cubist house put in its place. Now she graces the Museum of Cubist Art. The church Our Lady Under the Chain belongs to the Maltese Order, which published a brochure describing the church and its works of art. About its Black Madonna it says that she has not yet been analyzed by experts. Hence it is not clear whether she is an original or a, perhaps Baroque, "copy" of the Madonna of Czestochowa. To me she looks more like a copy of the Black Madonna of Brno, whose hand postures, dress, and reliquary-broche she replicates almost exactly. The side altar housing this image was dedicated by the German Marian Brethren of Prague. The inscription underneath the icon proclaims the privilege granted by Pope Clement XII: Whoever celebrates mass at this altar on a Marian feast day receives full absolution of their sins. Such a great privilege, as well as her crown, indicate that this is an important Madonna indeed, even if she is a copy of another Black Madonna. She must have had a reputation for having miraculous powers, forgotten perhaps in the decades of Communist oppression of religion. In the museum Convent of St. Agnes of Bohemia, in Prague, in the Stare Mesto part of town, one block from the Vlatva river, U Milosrdnych 17, 1396, 41.5 x 29.5 cm, tempera and gold on parchment and linen. The painting bears a Latin inscription on the back, which reads in English: "This image of the glorious Virgin, commissioned by (…) the most illustrious King of Bohemia, was painted to resemble the image in Roudnice, which Saint Luke painted with his own hand. 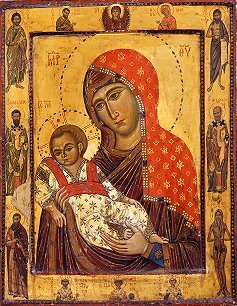 A.D. 1396"
Nonetheless countless copies and variations on the theme of this icon can be seen in churches throughout the world. One of the most famous is an icon in the monastery of St. Catherine on Mount Sinai in Egypt. This is the one Our Lady of Breznice closely resembles. Ean Begg states that an ancient icon in the monastery of St. Catherine on Mt. 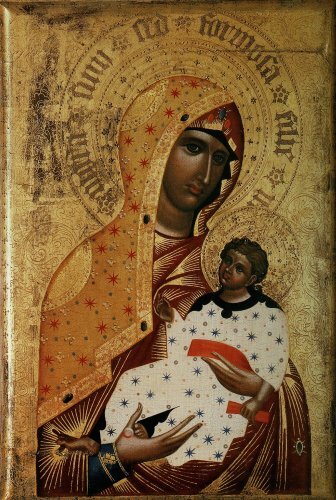 Sinai is regarded by some as a Black Madonna. (*4) Obviously the 14th century painter of the Breznice icon wanted to make clear that he was one of them. Here we see that the question, which Madonnas are black, is centuries old. The renovated icon from Mt. Sinai, 1280 A.D.
*1: This is an interesting symbolic combination of colors. In this icon it repeats the colors of the Christ child's clothes, an illustration of the idea that the Virgin is not only the mother, but also the bride of Christ. Red and white recur in St. Faustina's visions of the Divine Mercy, where two streams of light emit from the heart of Jesus, one red and one white. In Tibetan Buddhism red and white represent the complementary principals of femininity and masculinity, wisdom and compassion, form and emptiness. The Pearl of Moravia is yet another icon said to have been painted by Luke and brought to Constantinople by Empress Helen in the 4th century A.D. Eight centuries later Vladislav, the Duke of Bohemia, obtained it and kept it in his treasury in the castle of Prague. In 1356 Emperor Karl IV, King of Bohemia and Emperor of the Holy Roman Empire, gave this painting to the newly founded Augustinian monastery in the city of Brno. Soon pilgrims came from near and far because of the sacredness of this image and its reputation for miraculous powers. Barely four decades later, Emperor Josef II ascended the throne. His agenda was to establish religious tolerance of all the creeds in his empire. To accomplish this he had to reduce the power of the Catholic Church, which meant closing or destroying many of its churches, monasteries, and convents. The original Augustinian monastery with its Thomas Church was closed and converted into government administration buildings. The church now houses a museum. But the Augustinians were lucky, because the Cistercian nuns in their convent on the other side of town were kicked out and the monks were allowed to move in there, together with their treasured icon in its silver altar. Nowadays, the Augustinian abbey, housed in the former Cistercian convent, also accommodates the Mendel Museum. This is because Johann Gregor Mendel (1822-1884), the founder of gene research, was one of the Augustinian monks in Brno. All his research was done in the monastery's garden, where he even erected a meteorological station to study weather forecast. - Maybe this priest-scientist was a late fruit of Emperor Josef II's ideal of religious tolerance. *1: www.brno.cz/index.php The city's website, click on "Brünner Sagen" and then on "Die schwarze Madonna"
Housed in the Moravian Gallery in Brno, at Husova 18, 662 26 Brno, about 12 inches high, painted marble, sculpted in Naples by Tino di Camaino (c. 1280 – 1337) after 1317. This travel altar of King Robert of Anjou, also known as Robert the Wise (1277 –1343), is a highly political piece of art. At the time of its creation, the houses of Anjou and of Aragon were fighting over Sicily and Naples. Robert sought to unite the two houses by marriages and around the figure of the Sicilian Black Madonna of Tindari, of whom this one is supposed to be a gothic representation. (Though she looks nothing like the original. )The saints surrounding her are canonized members of the two royal houses plus Sts. Francis and Claire, the founders of the orders two of the royal saints belonged to.